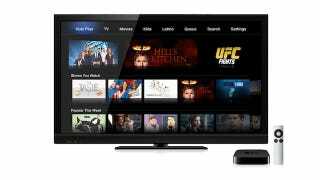 Because watching television is a notoriously harrowing and grueling process, Hulu Plus just underwent a major redesign for Apple TV, making it easier to navigate and shaving off precious seconds that could otherwise be spent with the TV people, you're real friends. Slide the arrows above from left to right to see Hulu Plus' layout before and after the redesign. Most notable in the new design, though, is the addition of content categories in a navigation bar across the top. Within each of these categories (Kids, Latino, Movies, Movies About Latino Kids, etc. ), you'll immediately get a glance at the newest content. Perhaps one of the more convenient features is the new "Shows You Watch" section that tracks your habits, alerting you to new episodes lest you miss a second.